You need an awesome little freeware GUI called Flac Attack. Download from the Flac Attack Homepage. Pre-reqs: You need to install the .NET Framework to be able to use Flacattack because it is written in C#. 1. Extract the contents of the zip file to the directory of your choice. I recommend C:\flacattack but it doesn't really matter. Using the gui (fagui.exe), set all applicable options in the ini file. By default, the gui will look for the flacattack.ini file in the directory in which it is located. If you already have a flacattack.ini file that you would like to use, simply copy it to the same directory as the gui. There may be new features that aren't present in your old flacattack.ini file. When you run the gui, you will need to update those features by making the appropriate changes in the gui settings. Once you are done making your changes, go to Help-->Check exe paths. This will check to make sure you have set up all the paths to the necessary executable files. Next, just go to File-->Save to ini and choose the destination file for your settings. This most likely will be the flacattack.ini file you are currently editing. If asked if would like to overwrite the file, say yes. If you would like to load a flacattack.ini file from another directory, just use File-->Load ini and that file will be loaded. If you do choose to use a flacattack.ini file from another directory, don't forget to make sure that is the file being used in EAC-->Compresson Options-->External Compression Tab-->Additional Command Line Options. (See EAC configuration below for full details.) Don't forget to save any changes you make using File-->Save to ini. * If you plan on creating flac image files, you must download and configure metaflac. It is needed to remove a CUESHEET metadata block which is inserted into the flac image file when encoding. This CUESHEET metadata block is used to decode the flac to individual wave files for each track which are then used to encode to lossy formats, such as mp3, mpc, ogg, and aac. 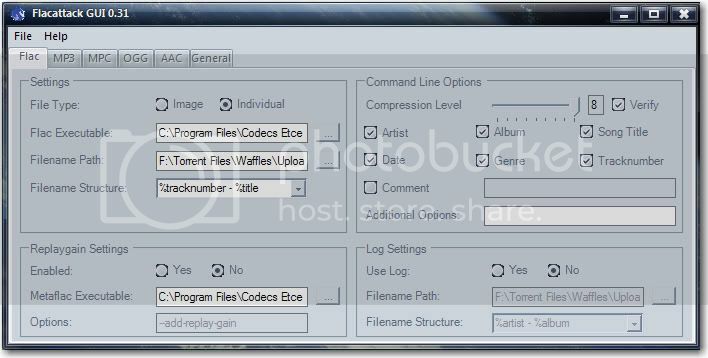 * If you want to use mp3gain to apply replaygain to your mp3 files, you will also need to download and configure the path to tag.exe in the flacattack.ini file. Tag is used to make all of the tags show up correctly in your audio player software (i.e. Foobar, etc.). * You will need to download and configure the path to tag.exe if you want to embed the cue or log files into your flac image file. * If you want to apply replaygain to mpc files, you need mppdec in your SYSTEM path (C:\Windows\System32 on Windows XP). * Do not use %title or %tracknumber as part of the cue or log file names. Substitute your path to flacattack.exe if it is different. Substitute your path to flacattack.ini if it is different. * Individual Flac Files: "Action-->Create CUE Sheet-->Multiple WAV Files With Gaps... (Noncompliant)" then "Copy Selected Tracks-->Compressed" or just hit the MP3 button. If you are ripping to individual tracks, you must create the cue sheet first. * When prompted to save your files, DO NOT use the same directory that you have chosen in the flacattack.ini file. 5. Look for your files where you indicated in the flacattack.ini file.